de Havilland DH.60M Moth VH-UOQ Goldfinch probably at Mascot c. August 1930.
de Havilland DH.60M Moth VH-UOQ Goldfinch at Toowoomba Aerodrome c. 1938/39. Photo: Frank Joel via his son Murray Joel. 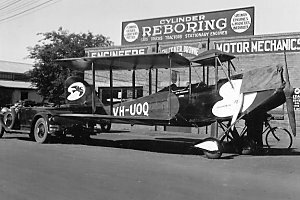 de Havilland DH.60M Moth VH-UOQ Goldfinch outside the premises of Falconer Browne & Co at 226 Margaret Street, Toowoomba c. 1938/39. 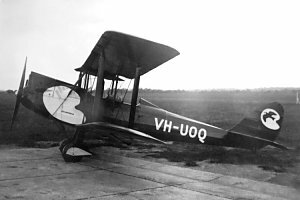 Registered VH-UOQ to Adastra Airways Ltd., Mascot, NSW. CofR No 393. CofA No 344 issued. 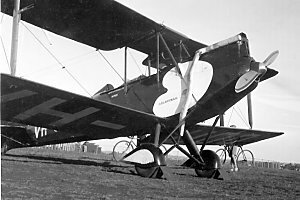 Fitted with a Gipsy engine. Crashed into Cronulla Bay, NSW. Wreckage sold to A.L. Needham, Sydney, NSW. CofR renewed after rebuild with a Cirrus Hermes engine fitted. Crashed in the Blue Mountains, NSW. Sold to J.K. Richardson, Toowoomba, Qld. Registered to J.K. Richardson, Toowoomba, Qld. Sold to Mrs. E.B. 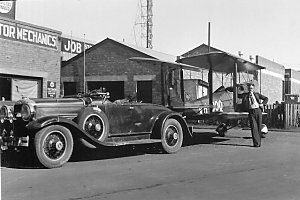 Jones trading as Airwork Co., Archerfield, Qld. Registered to Mrs. E.B. 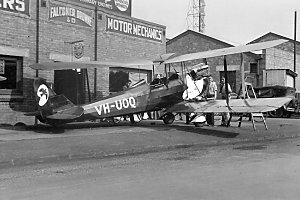 Jones trading as Airwork Co., Archerfield, Qld. Impressed by the RAAF as spares. This chronology is drawn from "The Historic Civil Aircraft Register of Australia" compiled by Bert Cookson and published by AustAirData. 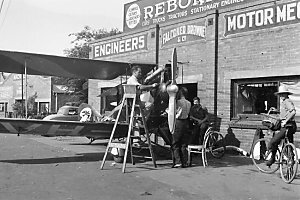 Thanks to Phil Vabre of the Civil Aviation Historical Society for providing the photograph. Added 5 images of VH-UOQ in Toowoomba. Thanks to Murray Joel whose father Frank took the photos.